and door locations. Windows are by far the largest contributor to moisture problems, mainly due to the significant number of window units found in the average EIFS-clad home. 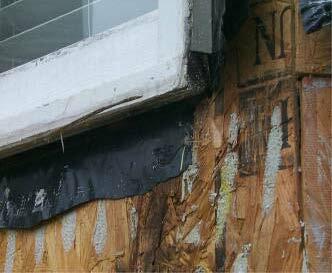 Many rough openings have no protection from leaks from around or within the window. This photo shows where no moisture barrier is installed around the window, allowing moisture from perimeter and window leaks to drain directly into the wall. 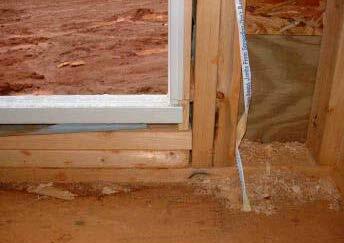 This photo shows the most common mistake made when preparing an opening for a window. The moisture barrier has been cut to wrap the corner at the miter joint. This is the most likely area of the window to leak. Moisture from the miter joint will run down the jack stud into the wall cavity. 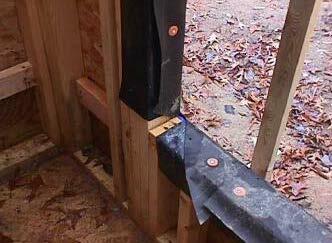 Also, if the rough sill is tilted toward the inside, then the moisture will drain to the inside, which is common. This is another example of cutting the moisture barrier at the sill/jamb location. This problem occurs on all homes, not just EIFS. 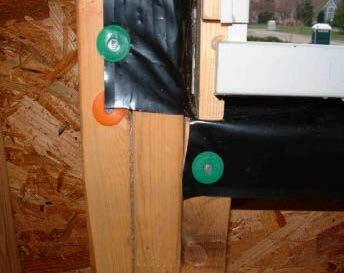 Once the moisture makes it to the batt insulation inside the wall cavity, rot is highly likely. Also, moisture leaking in from perimeter joints will drain along the jack stud and into this area. The moisture pattern under the corner of this window is typical. However, it is important to realize that moisture is likely to be coming from inside the wall, damaging the OSB from the inside out. A secondary drain plane, like those found in most cladding systems won’t make any difference if the moisture never makes it to the drain plane.